Whether it’s an efficient commuter for your daily travels to Boston, or a hardworking truck for your job on the construction site or home improvement projects, you’re bound to find something here at our Hyannis, MA Nissan dealership serving Cape Cod, Plymouth, Falmouth, Mashpee and Bourne that makes sense. These new Nissan cars, trucks and SUVs provide plenty of great options, all united by a general sense of style and technology. See what 2018 editions populate the bulk of our lineup, and find out when more 2018 models will arrive here in Hyannis, but more than anything, come on over today and we’ll get you started with the new Nissan of your choice. The new Nissan lineup is wonderfully filled out with all kinds of great cars, trucks and SUVs. Starting off with the Versa, Sentra and Altima, you’ll find a range of efficient commuters and family sedans, blending technology with fun driving dynamics at affordable pricing. The new Nissan Rogue, Rogue Sport, Pathfinder and Armada offer a similarly wide range of SUVs, ranging from the compact crossovers for younger, city drivers, to the full-sized, three-row vehicles that are great for the whole family. Then there’s the new Nissan Frontier, Titan and Titan XD, all relative newcomers to different pickup classes, edging out more popular trucks in terms of capabilities. All these Nissan models now come available with innovative safety systems and a lot more technology to choose from. Knowing what you want in terms of style and vehicle type will go a long way toward finding you the perfect new Nissan, but your budget play an important role as well. We’ll go over your new Nissan leasing or financing options, which will lead you to the best deals based on your budget and the kind of vehicle you’re looking for. 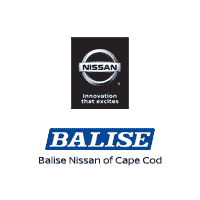 Take a closer look at the new vehicles found here at Balise Nissan of Cape Cod by coming over today and we’ll be more than happy to help you out. The Nissan Altima is one model that is sure to come to mind when you think of the brand. This four-door midsize sedan is available with two efficient engine options and other features including Android Auto™ and Apple CarPlay™. Predictive forward collision warning is now one of the standard safety features. With a maximum towing capacity of 8,500 pounds when properly equipped, the Nissan Armada is ready for your next adventure. Plus, there is seating for up to eight, so no one will have to miss out on the fun. Upgrade your ride with the Bose® Premium Audio System for more entertainment. If an electric vehicle is more your style, you’ll want to see the Nissan Leaf. The 100% electric drivetrain makes this vehicle the perfect ride around Hyannis, Cape Cod, and Falmouth. With the e-Pedal, you can accelerate and brake with only one pedal. Sports cars are great, but they’re not for everyone. The Nissan Maxima is the perfect combination of both worlds thanks to its 300 horsepower 3.5-Liter 24-Valve V6 engine. Put this car in Sport mode, and you’ll instantly feel a difference in your ride. The Nissan Murano boats impressive power, excellent handling, and it’s ready to take on the Bourne Mashpee, Barnstable, and Plymouth roads. Plus, its unique “floating roof” design and boomerang-shaped headlights will make it stand out from your ordinary SUV. Packed with innovative features, room for seven, and the ability to go off-roading, the Nissan Pathfinder is a joy to drive. On the safety side, the available Intelligent Around View Monitor has four cameras, so that you can have a 360-degree bird’s-eye view of your Pathfinder. The Nissan Rogue is powered by a 2.0-liter DOHC 16-valve 4-cylinder engine. Thanks to Continuously Variable Transmission with manual shift mode, available Intuitive All-Wheel Drive system, and the Eco Mode Button, you will experience a more efficient ride. If you love the Rouge but want a smaller option, the Nissan Rogue Sport is for you. The 16-inch wheels are made of steel, so they are lightweight. Also on the exterior, LED Daytime Running Lights and High-intensity lights will illuminate the night. The Nissan Sentra sedan takes your safety seriously and comes equipped with standard automatic emergency braking. And even though it’s compact, the Sentra offers plenty of room for those sitting in the backseat. Nissan’s Titan was designed with the job site in mind. Powering this pickup truck is the Endurance® 5.6-liter 32-valve V8 gas engine that pumps out 390 horsepower and 394 pound-feet of torque. No job is too large for the Titan! For a hatchback that performs well, has plenty of space, and offers some of the best available tech features, look no further than the Nissan Versa Note. This vehicle is perfect for first-time car buyers around Martha’s Vineyard and Nantucket.